Well there you have it! Ali Brownlee has proven he can ‘go long’. 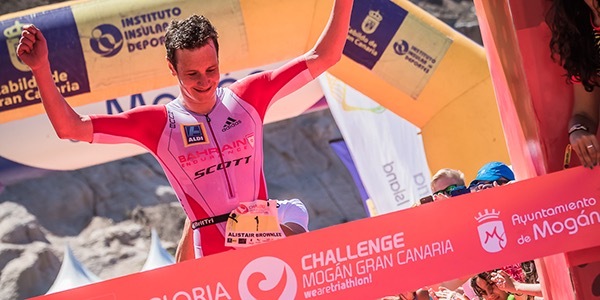 Incredibly impressive performance from the Olympic and commonwealth standard-distance king saw him crowned the winner at The 2017 Gloria Challenge Mogán Gran Canaria. The ‘medium’ or ‘half-iron’ race was the longest of Ali’s career to date: 1.9km swim, 90km cycle, 21km run. Alistair extended the gap from David Giardini and Pieter Heemeryck on the bike and won the pro men’s race after a strong run in a time of 04:03:09, stripping 10 minutes and 35 seconds off the course record. Emma completed the course in a time of 04:35:15, knocking seven minutes and 15 seconds off last year’s women’s race – setting a new course record. Congratulations to her and her Team Dillon training outfit! ← HOW FAR CAN YOU CYCLE/ RUN/ SWIM IN 3MINS?